The Maschinenmensch (German for "machine-human") from Metropolis, is a gynoid (female robot and female android) played by German actress Brigitte Helm in both its robot form and human incarnation. Named Maria in the film, and "Futura" in the Novel, she was the first robot ever depicted in cinema. Robot Maria's haunting blank face, slightly open lips, and pronounced female curves in the film have been the subject of disgust and fascination alike. C-3PO was played by Anthony Daniels in all six Star Wars films. Daniels initially did not agree to be cast as C-3PO; but changed his mind after reading C-3PO's part in the script and seeing a concept painting by Ralph McQuarrie, who based his early design largely on the Maschinenmensch from the Fritz Lang masterpiece Metropolis. Lang (right) checks preparations for an upcoming scene. Metropolis, 1927. 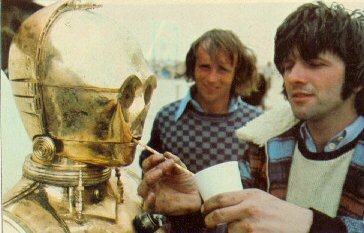 A young George Lucas confers with Anthony Daniels as C-3P0 on location in Tunisia, 1976.